Goat carts have been a part of the Amish way of life for centuries. 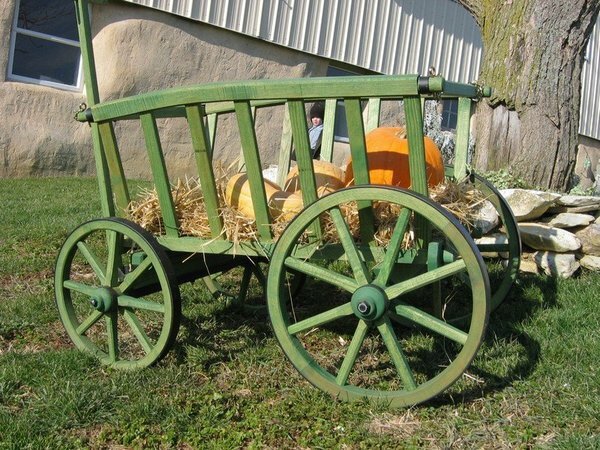 With solid wood construction and a traditional German design, this fully functional goat wagon is as perfect for seasonal displays as it is for moving firewood, leaves, and other outdoor necessities across your garden space. Try filling your wagon with hay bales, Fourth of July streamers, Thanksgiving pumpkins, corn stalks and much, much more! Add the galvanized steel liner to use this large goat cart as a backyard herb garden, tomatoe garden or flower displays. This cart features steam-bent fitting and a beautiful pin chain as its finishing touches. Choose from a wide variety of finishes to create your custom dream to goat cart. If you have any questions at all, please don't hesitate to get in touch - we would love to talk to you or visit our store in Florida so we can sit down and chat. Thanks so much for the quick response to the missing hardware for my goat wagon. I received it within a few days and was able to assemble the wagon. It's very nice and we are very happy with it. We'll be training our two wethers, Mike and Ike, to pull our grandson around in it. Wooden Wheel with Rubber, Double Tree Wooden Shafts for 2 Animals, Finish: Stain - Forest Green, 3300 Series Varnish.